New Zealand was an eager participant in the 1899–1902 South African War, fought between the British Empire and the Boer South African Republic. 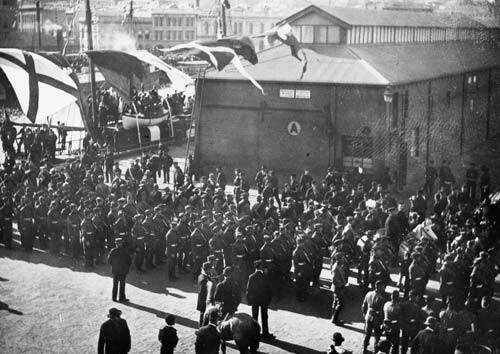 Some of the 2nd New Zealand Contingent are shown embarking in Wellington in February 1900. In total, 10 contingents (nearly 6,500 men) went from New Zealand. Premier Richard Seddon told the tens of thousands who gathered to see the first contingent leave that New Zealanders ‘would fight for one flag, one Queen, one tongue, and for one country – Britain’.